When I was fifteen, I was part of a project which brought together groups of teenagers from the US and the USSR together to live together for one month, make a play, and tour it. My group went to Latvia. We arrived on the morning of my fifteenth birthday, by train, and were greeted with flowers, singing, dancing and open hearts. This experience shaped my view of the possibilities and power of performance and international collaboration, as well as introducing me to friends I treasure to this day. The project is inspired by a Latvian folk song/dance used to clear sacred space, to banish evil. This song was part of the performance we created together as teenagers, and it has been in my mind since then. In this song, it is dance that clears away evil and sanctifies the space. This is a ritual that exists all over the world, because all over the world, cultures throughout time have danced their nightmares away, and their dreams into existence. Help bring our boundary-breaking performances to an ever-widening audience. Please visit www.lynnarts.org for complete guideline information. Conditions: Work submitted for consideration must be in physical form and delivered to LynnArts during the stated drop off times. Do not transmit work electronically or submit on CD, etc. All work must be original, ready for hanging or display. Drop-off: Thursday, January 17, Friday, January 18 and Saturday, January 19. Work not accepted: Wednesday, January 23, Thursday, January 24 or Friday, January 25. Accepted work: Saturday, March 9 or by special arrangement. subject to change, please call before visiting. Parts and Crafts is an open workshop and community space in Somerville. Our programs run out of Sprout's studio at 339R Summer Street, just outside of Davis Square, where we run creative arts, engineering, science, and technology programs for kids of all ages. We're open five days a week (Monday - Thursday, and Saturday). Here's a quick overview of what's going on over the next few months! An afterschool workshop introducing kids to Python, a powerful, popular, and highly alliterative programming language that focuses on clear syntax and easy readability. We'll cover some of the rules and tools and use them to build simple games. Experience is helpful, but not necessary, but participants must know how to read and type at a reasonable speed. Paired with open shop, where kids can hang out, play board games, hit each other with boffer swords, and otherwise have a blast after school. Dates: Thursdays, January 10 – February 7 (5 sessions), 3 – 5 p.m.
Books, shoes, bags, clothes, hats... If you've ever thought "Hey, that's a cool thing! I want to make one of those!" then Tuesdays in January at Parts & Crafts are for you! We'll be making artistically visually pleasing yet completely functional objects that you can really use! Make your own journal or sketchbook out of just about anything! Want to make a pair of leather sandals? Knit a hat or scarf in no time! Make a messenger bag for carrying around your knitting & notebook! Dates: Tuesdays, January 8 – February 5 (5 sessions), 3 - 5 p.m.
An afterschool program introducing kids to basic woodworking techniques. Workshop will be geared towards making simple contraptions (tables, very simple stools, things with wheels, etc). Dates: Tuesdays, February 12 – March 19 (5 sessions, no class on February 19), 3 - 5 p.m. In this workshop, we’ll go through a series of beginner electronics projects, introducing kids to basic components (resistors, switches, capacitors, diodes) and concepts (the relationship between electricity and magnetism, voltage, current, and capacitance). We’ll take apart and examine scrap electronics, learn how to solder, build motors, play sounds, make things blink and spin, and build connections. Sample projects might include: Motor cars, drawdios, popsicle stick reed switches, DIY motors, lightsabers, shake flashlights, solar-triggered bristlebots, and more! Dates: Thursdays, February 14 – March 21 (5 sessions, no class on February 21), 3 - 5 p.m. In this five-session, workshop, we will work together on a series of interesting circuits and programs using the Arduino, an open-source hardware platform designed for artists, designers, hobbyists, and anyone interested in creating interactive objects or environments. Dates: Saturdays, January 12 – February 9 (5 sessions), 10:30 - 12 p.m.
Age: Open to kids ages 11-16. We have a limited number of laptops, kids are encouraged to bring their own in! Please note: Modifying code also involves having the game open on your computer for large amounts of time– and it's very likely that kids will play it! We're not going to insist that kids be coding at all times, or police open computers to make sure they're not playing vs. coding. We expect they'll be doing a little or a lot of both! Dates: February 16 – March 9 (3 sessions, no class on February 23), 10:30 - 12 p.m.
A weekly drop-in workshop for kids and families to make things together. People are encouraged to come to open shop with projects and ideas of their own that they’d like to work on and explore, but we’ll always have something in mind to get you started if you’re suffering from maker’s block. Dates: Saturdays, starting December 1, from 12 - 2 p.m.
Community Path Public Design Meeting! MassDOT & their Green Line Extension Design Team will present the 30% design plans for the Community Path Extension. There’s progress on the the Community Path Extension design as part of the Green Line Extension. But the Community Path is not a “done deal.” So we need your help to get the Path fully designed and built. MassDOT’s Green Line plans have only partial design/build of the Path – and exclude the last leg of the Path. But we need these last 300 yards of Community Path (near Brickbottom) to reach the Charles River & Boston! This part of Green Line is slated to begin construction next year (2013), so please tell MassDOT to design+build the whole path, including this “missing link,” so the Community Path will not be a dead end just before reaching Lechmere! by extending the Community Path along the future Green Line extension. Somerville Arts Council launches its new series: "Artist of the Month"
On January 7th, 2013, the Somerville Arts Council will announce its first Artist of the Month. This new series will feature a different creative Somervillian each month –- painters, poets, pianists, you name it! The program is a way for us to celebrate the enormous wealth of talent in our city, by shining a spotlight on a different creative Somervillian on a regular basis. We’ll feature an interview with the Artist of the Month on our website, as well as images of their work. Each new artist will be announced on the first Monday of each month. And in December, we will have a public event to honor all 12 artists featured in 2013. All artists who will be part of this program live or work in Somerville, MA. They were chosen by a panel from a list of nominees; many of the artists were nominated by the Somerville community through the Arts Council’s website. This program is put together by Coordinators Jenn Harrington and Kellie Veiga, and Arts Council board member Tim Devin. It's inspired by the Nave Gallery's "Featured Artist" program, which ran from 2005 to 2009.
other beverages will be served. contradictions and strengths present when two individuals form a pair. Visual artists working in all 2-D and 3-D media (including video and installation) are invited to submit work. You can also email your submission to sberstler@navegallery.org. Entry fee can be paid online at: http://navegallery.org/nave/support.html. Please include in the memo a note that this is for "Delicious Torment." Join us for this family-friendly fun afternoon workshop! Start with a surface: wood, plexi-glass, or the motherboard from a computer. Add 2D materials like photos, newspapers and magazines, maps, bubble wrap and aluminum foil. Then take your pick from buckets of recycled 3D debris like computer parts, buttons, shells, and other small objects. Come out with a beautiful piece of art to hang on your wall! Easy as one, two, 3D. Students will get to experiment with dynamic patterns and sculptural qualities of found objects, and become familiar with a variety of methods of combining materials. 3D: computer & printer parts, shells, toys, junk, buttons, jewelry, other debris and small objects. 2D: photos, papers, maps, cardboard, foam, bubble wrap, foil. Surfaces: various shaped bits of wood, motherboards, plexi glass. Tools and fixatives: scissors, mod-podge, wood glue, brushes. Children are welcome in the company of an adult. The parade of migrating waterfowl at Fresh Pond continues into early winter. By December, the long-distance flyers such as canvasbacks and redheads have arrived, and all three merganser species may be present. We’ll use a telescope to identify birds on the water, and we’ll use binoculars to look at over-wintering songbirds in the trees. Dress warmly; it can be very cold and windy near the water! Beginners are welcome. We have binoculars to lend and will show you how to use them. Signed Copies of Harold Feinstein | A Retrospective are available through the gallery. Harold Feinstein and Friends, (a talk, book signing, party and fundraiser), will be happening atAperture Gallery on Monday, December 17th from 6-9pm. Read more about it on our blog. Saturday, December 15th at 1pm. Panopticon Gallery in conjunction with the Decaneas Archive are excited to be exhibiting photographs by Bradford Washburn and Vittorio Sella from January 11 to February 25, 2013. Observe, and get on with it. That's Franson's mantra. Bill Franson studied at the Art Institute of Boston and went on to earn a B.A. in Philosophy at Calvin College in Michigan. He worked at several production houses in Boston until going out on his own in the mid 90's. His work has been exhibited and collected both locally and nationally and he currently teaches at the New England School of Photography (NESOP). A senior at the New Hampshire Institute of Art, Megan Lowney set a goal to create a visual cohesion between the geometry of the human form with organic textural elements in nature. Hard rocks and strong trees lend themselves to masculine qualities, while delicate foliage optimizes femininity. It took a trip to Paris to the Lens Culture FotoFest portfolio review event to meet a fellow alumna from the Massachusetts College of Art and Design. Agnieszka Sosnowska (b. Warsaw, Poland), received a B.F.A. in photography from the Massachusetts College of Art in 1995 and a M.F.A. in studio teaching from Boston University in 1999. Her ongoing series of self portraits reflect surreal memories of her rural lifestyle and upbringing and hint back to her childhood. In 1996, Sosnowska returned to Poland to complete a Fulbright Fellowship where she documented the Tatra highlanders. In 2005, she completed a American-Scandinavian Fellowship in Iceland documenting the local farming culture. She currently resides in Iceland. In time for the holidays, Lisa Trachtman of Brookline, MA will be my featured artist atBlue Cloud Gallery for the month of December. She is a jewelry maker and creates many different styles, from fun to funky to elegant. Lisa has been designing since she was a child. She spent time with her father in his shed (now a modern studio) creating everything from glitter ornaments to walk-in doll houses. 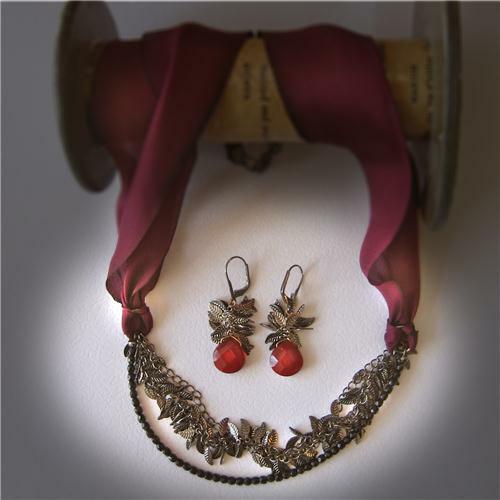 She started creating jewelry in earnest about 10 years ago. Romance, nature and old world charm inspire her work. 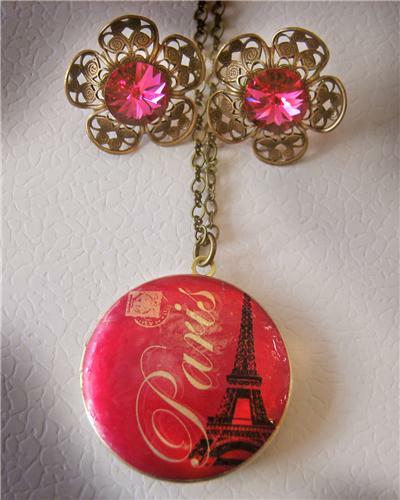 Lisa silkscreens retro images such as Marilyn Monroe, the Eiffel Tower, Blue Fairy and many others onto her lockets. She combines coin pearls with metallic leaves as studs; enamels discs and combines them with brass birds or dragonflies; adds crystals and tiny seed pearls on necklaces; and stamps inspiring words on key and dog tag pendants. These are but a few of the many popular items she designs. Blue Cloud Gallery is treating the public to a special 20% off any two pieces of Lisa's jewelry. Earrings to match a necklace? Gifts for two friends? One for you, one for her? You are not going to want to miss this. The third annual Somerville Illuminations Bike Tour will be held in a few weeks. Please join us. Details are below and attached. The guided group ride will be shorter this year so folks can spend more time looking at the lights and stay warmer. For those who would like to tour the longer route from last year, maps will be available. Those touring the longer route may continue after the short guided tour concludes, may meet with others at the suggested times below or tour the route on your own schedule with friends. Maps: available at city hall, donation recommended. Don your best aloha shirt and join us for an afternoon of traditional and contemporary Hawaiian dance, featuring Somerville-based hula troupe Hui Lehua 'O Kamawila. Sunday 12/16 2-3pm, at Dance Union, upstairs at Cafe Tango, 16 Bow St. This performance is funded through a Somerville Arts Council Cultural Heritage project grant. Best wishes for a Great and Prosperous Holiday Season.